The Overview tab provides insight into your overall engagement levels. Start by selecting the social network you'd like to analyze on the left hand side of your dashboard, and then selecting the Overview tab. The performance table shows aggregate metrics for all posts sent during the selected date range. This table is designed to give you at-a-glance insight to how you're performing over a specified date range. These are key performance metrics for each social network and you want to see lots of green! Check this table regularly to help build up your long-term intuition on overall performance. The average performance chart shows you the average performance per post, for all of the posts sent during the selected date range. This chart will help you identify, set and measure performance goals. This is also a good table to review regularly, to help build up a strong intuition on performance over a long period of time. The metrics breakdown chart allows you to view performance metrics and followers over time. You can choose to view the performance for the previous period as well, which will allow you to compare metrics for the same amount of time immediately proceeding the selected date range. In the legend at the bottom of the chart, you will find the total number of the chosen metric over the selected date range. 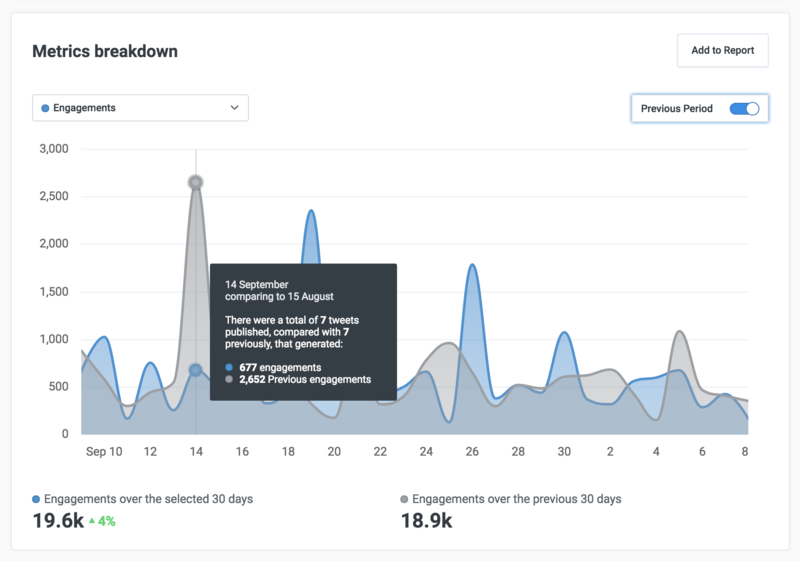 This chart allows you to gain insight into the general engagement of your posts, your overall number of followers and to compare performance over periods of time. In an ideal world, previous period totals would always be lower than the current period. Please note, the Hourly engagements chart is only available for Twitter Profiles. 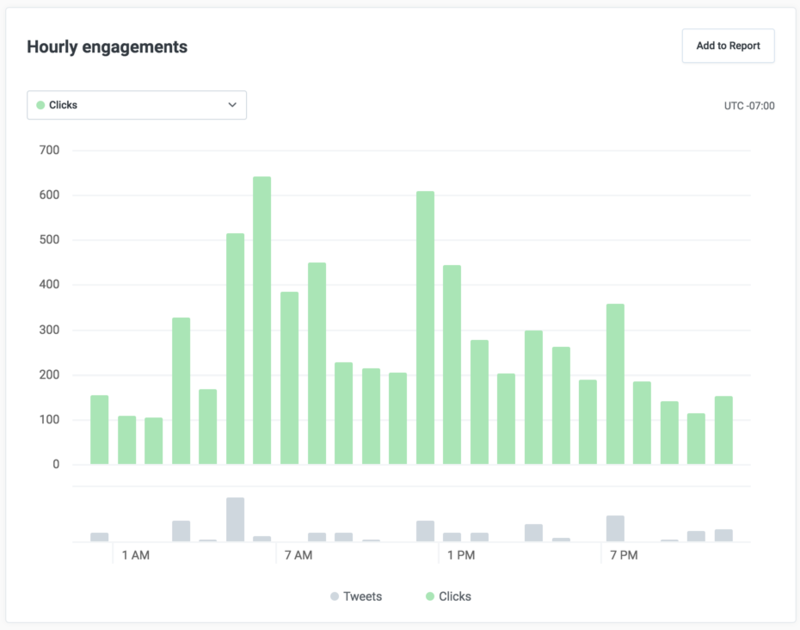 The hourly engagements chart shows you a breakdown of the engagements you earned, by the hour, for all the tweets sent in the selected date range. The bottom portion of the chart shows you during which hours your tweets were actually sent. This chart is useful for identifying when your audience is most active. Keep in mind that when you tweet will also affect this, but it should provide some insight into the best times for you to engage.